Hoo boy, now that was an interesting day. ...to be followed by the worst day for US equities in a couple of years, with Spooz closing below the level that's held the range since February. Was FM a clandestine member of the Plunge Protection team? Or was this just some sort of karma or kismet? Either way, Macro Man is very curious indeed to see how dip-buyers react from here. 'Cause let's face it: on an index level, US indices were virtually the last game in town. * Erstwhile darling the DAX is -16% from its April peak. * EEM is at its lowest point in six years. * Within that, Brazil (EWZ) has actually breached its lows from the crisis, though a large part of that is down to the BRL returning to its bad old ways of a couple decades ago. Only the Nikkei has retained its mojo; indeed, it's been the best performer of all. That having been said, it's up against resistance from the highs of the Internet bubble, and when cracks appear everywhere around the world, even Abenomics would appear insufficient to inure Japanese stocks. A modest short with a stop above the year highs would appear to offer pretty solid risk/reward, particularly if markets price out the Fed and the dollar takes a tumble. Anyhow, a good old-fashioned dollop of turmoil should be good for the macro complex, particularly if things like the Nikkei play ball and squeeze out the lazy longs. Here's hoping eh dip-buyers hold off for just a little while before attempting to push us back into the same old 5% range in the SPX. "Fade Nico" - should probably make an appearance too! Are China's reserves relative to their money supply much higher than the East Asian countries in 1997? It is the control of capital flows that has the best chance of keeping China from that fate. Btw, wasn't the AFC well on its way in '98. The Russian default was the big one in '98. Congratulations to anyone who was riding in the gold decorated wagon. It looked so weak during the summer Greek-o-drama that hipper thought gold had lost the spirit for good and missed the train completely. Obviously it did not and the more likely answer of course is that gold is true in a sense that it doesn't react to those fake headline crisis only the real deal crisis. hipper got rid of his euro shorts yesterday and has been bleeding all around. He is amazed to see EUR as the new safe heaven, marking it the new barometer of risk. Of course since everything needs a story this time it seems to have been pinned on Tsipras resigning. Earlier hipper sold modestly itm calls for the US equities, but obviously they could have gone a lot deeper. He still thinks EZ might have a rabbit to pull out of the hat considering LEIs were pointing to that direction toward the year end, but that it will be short lived considering the freezing headwinds blowing against the S.S. Global Trade. And if they look too good, it will crush equities and any pockets of growth resistance anyway using the FX lever. He went in USTs but will probably leave soon considering that oil might begin a stabilization process within the next $10 and growth issues are well known by now. He hopes to play a small bounce alongside a DAX bounce but after FM left dips just might not prove to be what they used to. EUR (and JPY?) seems to be a/the key here. .Eur not a safe haven. More likely an unwind with Eur equities.Ecb goes quiet for Aug and QE trade unwinds. Expect some major jawboning in Sept. Draghi to speak at Jackson's hole? However I would add that they are not evenly distributed relative to GDP size. I would further say that $ denominated private and public debt and carry trades of all sorts have also increased in line with those CB's reserves. Some estimates would put the USD liabilities for the EM space between 4 and 6 T$. Granted, we might not see South Korea asking its citizen to bring their gold to local smelters but I would say we are seeing the capitulation phase in EM and commodities which is now spilling over into DMs. Probably the magnitude won't be as bad as 1998 but it sure does feel like an echo. By November (if not earlier) this will be water under the bridge and we should see the last equity up leg in DMs as well as a nice rebound in EM s for 12 to 18 months. The problem is always the same: how to catch a falling knife when the fake rebounds lure you in before another random down wave. A major, major difference between China now and EM in 97-98 is that China runs a current account surplus which can offset a chunk of the capital account deficit (in addition to have a huge pot of FX reserves.) In 97-98, EM countries more or less universally ran large current account deficits courtesy of exchange rates pegged too strong and had large external liabilities courtesy of domestic firms playing the carry trade. Again, in China's case today the C/A will offset a lot of the pressure caused by the capital account, a release valve that did not exist 17-18 yrs ago. MM - I disagree - I doubt that the current a/c for China is large enough to offset a problem whose size is frankly impossible to forecast and could potentially be orders of magnitude higher - and they just sunk about $1 TN into their crashing stock market which basically at this point is down the toilet -as for the $3.6 TN in fx reserves, they will look very insignificant if the kids decide to take their toys and go home. The 1st derivative of their fx reserves is decidedly negative, and I would suggest the 2nd derivative is about to hook up. China is cooked - may or may not go down in a straight line but we are talking 2-3% CAGR for the next decade if they are lucky. Goods trade as a % of global GDP will keep decreasing in accordance. @ washedup- there is no real historical precedent for a C/A surplus country sustaining an uncontrollable weakening of the currency that it has tried and failed to push against. The closest I can come up with is Japan in 97-98, though even there the intervention was half-hearted...and in that case, the stabilizing weakness ended with a bang, not with a whimper. Oh, and before we consign the Chinese equity market to the bankruptcy firm of Armitage and Shanks, shouldn't we wait for it to be actually down on the year? Its so easy to get worked up about late summer moves. I'm not saying this isn't the start of something bigger, it might be, but I want to see what the fall flow looks like before I get too worried. Frankly I don't see what the big issues are. This might be a problem and we cant really bottom until dummies like me understand the issues, but as of now not a whole lot has changed. China is weaker, but out of all the economies in the world they probably have the most firepower (both financially and politically) to enact countercyclical policies. 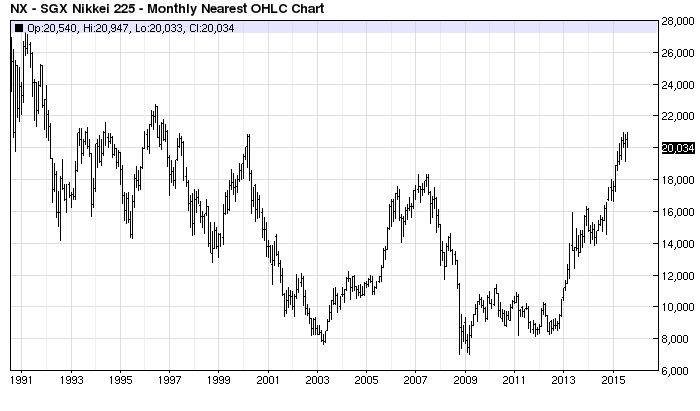 Commodities are obviously having a tough patch but this is nothing new. While some of the balance sheets are probably too extended to make it without restructuring, I don't see the sector posing a systemic risk (maybe in certain locales like one commenter has been noting of Aus banks but this is a strech I think). Everyone wants to talk about oil. Companies and regions and producers may come and go but on statistically relevant timeframes the demand is there. 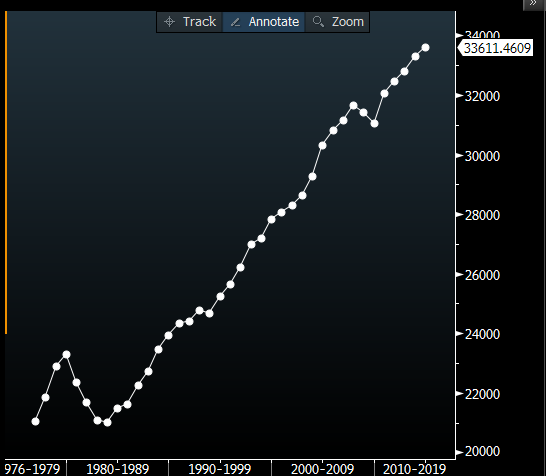 Here's global oil consumption since 1980. MM is right, this is not exactly '97-'98. The problems in EM are completely different. But, reserves are a useless tool in battling today's problems. I might even say they are the cause of today's problems. Now vs. AFC: different causes, similar outcomes. A little perspective can go a long way, especially on days like today. But that's my point MM - the devaluation that was forced by the market in 1997-98 and led to a domino effect, will be done slowly but deliberately by China to solve an entirely independent problem, namely a complete lack of growth sans exports, and THEN the stage will be set for the 1997 type crisis for China's competitors and trading partners, who I assure you have nowhere the level of warchest that China does. As for equities in China being down for the year, the median investor is in fact down for the year, and Behavioral Finance would suggest a 30% drawdown from the highs damages sentiment more than reminding oneself that there still are some paper gains left. China stock market is on the edge of where the govt forced brokers to buy. I thinks its possible we see them make some headlines over the weekend, but if it starts trading below by the end of next week, watch out. 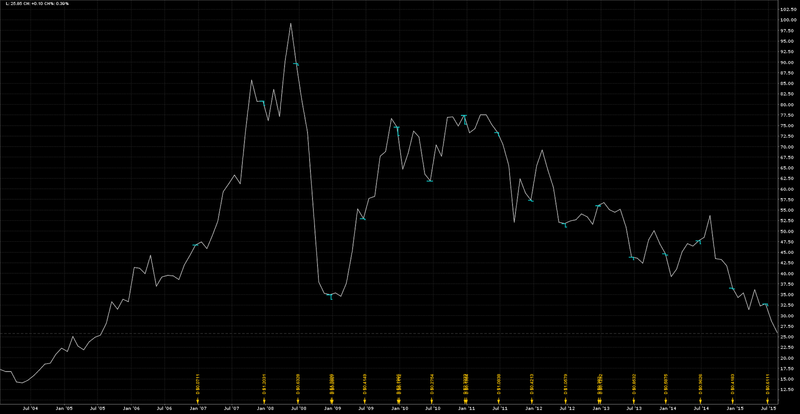 I'll wait for VIX to shoot up a bit more and catch up with HY spread b4 buying / covering. Since FM is no longer here. As a dip buyer (for now), I am buying at DOW -450 today. Has LB fallen out of that hammock yet? "asx200 will be a bloodbath monday"
It already is (closed at 5214, last trade in futures 5055). "Has LB fallen out of that hammock yet?" "Sentiment is too negative for any significant correction to happen in the short-term. All it takes is a little buying in AAPL and the whole happy clappy summer rally machine will be in full swing. So if I was to punt for the short term it would not be from the short side at the moment. August almost always sees one or two silly season rallies. Bonds look a little overbought here also. So apart from one or two tiny punts, we concur with MM that it's still Hammock Time." Not the best forecast, but maybe he has slept through it all with no harm. I am not sure China will do or can do anything to boost stock markets at this point. Let's hope Jackson Hole next week can make a difference. Why do you all try to be so clever (and fail)? 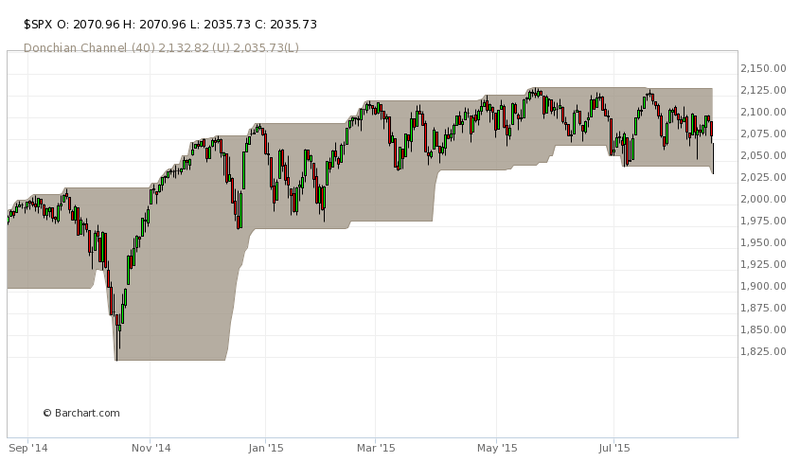 I hope you all JBTFD in US equity indexes. The Fed will NEVER significantly raise rates again in your lifetimes. Please remember that the short thesis has been invalidated, and take great care on anticipating a rate hike anytime before 2020. Have a pleasant w/e. Ha FM - welcome back - certainly the probability of a hike this year is very low now unless the jobs report for sep is a doozy, which given the stealth creep up in jobless claims looks unlikely. I think before all is said and done the Fed will be buying corporate bonds to stave off the next credit crisis - may as well buy that stuff now. Today was obviously expiration related, but that also means we can't really say there was capitulation selling - sentiment seems way way too negative right now - the world takes its time going to hell in a hand basket, folks, everyone just stay calm. I highly doubt a deflation hurricane will be the catalyst that finishes off this bull market for good, given thats the easiest excuse for friendly policy - this is more akin to the events of oct 2014 than oct 2007 - my 2 cents anyway. Did I miss something? A bit surprised by the action having anticipated another silly rally, but given our August attitude and limited positioning during extended Hammock Time, no harm done here at Falling Knife Capital which now leads >90% of global macro fund train wrecks YTD. Our wait-and-see attitude on the energy complex and EMs has been vindicated, there will eventually be a truckload of value there for Kevlar wearers. A bit odd not to see a screaming rally in USTs today, more of an equity than a credit event? Given the action in Flamingo stocks (AAPL etc) one assumes that lazy sunbathers have been killed this week. We do seem to have entered the unwind of (Long USD, Long AAPL, short EUR) that some of us talked about for ages earlier in the year and then got bored waiting for. I can see a case for buying European equities and shorting EURUSD some time on M or Tu this week. EURUSD has overhead resistance close by and Bucky should find his feet fairly soon. @Anon 2:09 AM: LOL no. I actually had a good day today (but only day-trades, too short-term to be of interest here). PS Left a post on yesterday's thread replying to the various comments in my direction. ...almost felt like its some HF feedback loop smashing into super low liquidity. The narrative a week from now is regulations etc @ 2100. Wouldn't that be a nice end to the summer. This got a whole lot worse than I first thought. Winginit’s symbolic long hasn’t hurt much but emotionally gave a ride. It is going to be exciting to see how this opens up on Monday. EURUSD almost at 1,14 you got to wonder how that's going to be digested. I am personally hoping for stabilizing markets and perhaps an opportunity to actually buy equities near term for a nice little bounce. Regarding the hft feedback loop Mr t , you are correct but that is also a symptom on not enough buy programs in the market. Like in hy, equities just hit and air pocket. European equities are interesting, but it's a very lazy macro trade ( I will be the first to admit it, even if I still like it relatively) I am not sure where new money is gonna come from in the next 2 months on that one. Plus most macro traders that use stops, and if we haven't gotten to them, we will soon. Am I the only one that is still pretty negative on this move?. I really need to see em currencies stabilize. Malaysia is mess, Columbia taking whipping boy status away from brazil, high yield has no bid. And S&P is only down 7% from the high. Feels like we are going to push the next week below 10% and induce some kind of reaction. Oh and then if the fed raises rates, I have very deep concerns about em. Yes they are getting cheap but fundamentals are still deteriorating rapidly so hard to know how bad earnings will get. Certainly there is very little interest and money flow there these days. From El erian ..last one but worth it. Nasty breaks all over the place; I don't think donning the kevlar makes sense just yet. But I do agree with LB that EMs/energy will be the trade of Q4 and Q1. The biggest surprise to everyone would be if BOTH legs on something like long EWZ/short Apple (or pick any other EM/Pink flamingo ratio) starts performing. In the very near term, I guess punters will soon be looking for a bounce (Turnaround Tuesday? ), but I think new lows will be made until a bottom at some point in October. 3m/3m Stock-to-bond return ratios should will tell us. On the Fed, I think they will go in September and then spend all their energy reassuring markets that they will tiptoe their way forward. As for the euro, it is no more a safe haven than the yen has ever been, but the combination of negative interest rates, QE and a surging external surplus means the FX becomes a carry trade funder ... i.e buy the euro in panics and all that. Incidentally, the macro flows support this story too. Forget about EMs weighing on Eurozone exporters. They are, and it represents a headwind. But the KEY story is surging U.S. and U.K. demand pushing the Eurozone trade surplus to new highs in the last 12-to-18 months. No one is telling this story (well, almost no one ;)) ... but it is an important one! I wouldn't touch EM till we see an economist cover titled 'submerging markets' - no predictions on timing. CV, I don't know about surging demand for euro exporters, but they definitely need a weak currency to have any chance of keeping the dream alive and it has helped their economies already - the only problem is, so does everyone else, and everyone can lean on the dollar only so much before the rubber band snaps. Bucky is at a very interesting juncture in terms of MA support - ironically, if this carry trade unwind sends USD into free-fall, knee jerk reactions aside, that would annihilate european and japanese equities, which have become hedge fund darlings recently. It doesn't really hurt the US but I doubt the markets would act like that. Interesting commentary from Art Cashin on EM currency unwind and the op expiry in 1987. Appreciate it's from a goldbug site but if you read what Cashin says..
"ITG’s proprietary trading program – Project Omega – traded about 1.3 billion shares total, and 20% of that was in POSIT. While it traded 1.3 billion shares, that figure does not tell the story, because those are just shares it traded, and not the size of the orders it traded against, which are most likely many times that figure." MM, Chinese down on the year. What now? If this is handled badly across Asia we could see bank runs. CBs have unlimited ammo. That's pretty much the point of having a CB. CBs helping one dude to buy a $175m Picasso, some Chinese dudes to buy $10k claret and another board of dudes to buy back their shares at already inflated prices.... those CBs help noone but a few. It just does not work our children will read the 2000s experiment as the biggest failure in history, a truly cold-efficient systematic social class divider. Capex has been sacrificed to quick get-rich buyback schemes by US corporations. This is pure suicide for a nation's wealth at large, to the benefit of a happy few. @MM "shouldn't we wait for it to be actually down on the year? " Done. Be careful what you wish for. Nico congrats on a great short. Tell that to the E&P names who have been allocating multiples of OCF to capex. Or all the downstream beneficiaries of that capex (steel, software, autos, housing...). I don't think lack of capex has widely been a problem. If anything, too much capex with too small hurdle rates? Or am I too focused on the commodities space? Does anyone really expect Apple to allocate 50B/yr in capex/r&d? Nico indeed it was a good short, but i do wonder at what level was it that you got short but nonetheless kudos to you for holding onto the short. Mr T, i totally agree that the lack of capex is not the issue, but its the low quality capex spending on marginal projects using leveraged money that i think will come and bite everyone. I for one think that this move is abit overdone in EM space but i think you are right Abee, we need to see currency stablise before confidence returns. The indiscriminate selling across EM though seems to have opened up some opportunities for the brave souls and those with any ammo left. I for one have started buying a basket of selected asian EM currencies - mainly on crosses as I don't see it being the greatest trade to sell USD here ahead of an imminent fed hike this year (in my view still sep the most likely candidate). 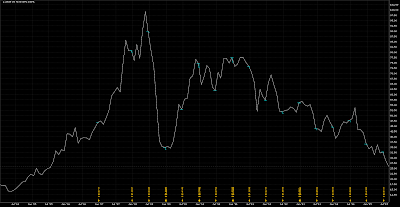 And at the risk of being called lunatic, I am also starting to fade this bund rally. It is time for a reality check for all of us. Maybe China has been economical with the truth about its growth and future prospects. Maybe oil and commodities have fallen out of bed! Yes, emerging market currencies have been trashed against the Dollar under a cloud of threatened higher interest rates being implemented in the US. It is also not unreasonable to surmise that stocks are fully valued. Also QE, which at the time of introduction in March 2009, was absolutely essential, is starting to wear off in places. QE has also largely been responsible for massive rallied in US and UK stock markets. From 9th March 2009 – the day QE was introduced - the FTSE 100 went up 100.5% (from 3542 to 7103) to 27th April 2015. The S&P 500 went up from 9th March to 18th May 2015 214% (676.7 to 2129). So how could anyone possibly be surprised that there has been some profit taking from wholly unrealistic increases in the value of many shares? Fading Nico has been the most profitable strategy on this blog. However even a broken clock is right once a day, and this time he got lucky. Maybe he makes back some of his many losses, but I predict his call for global armageddon means the market bounces here. •China news will continue to rile the market, though if there is one silver lining in the Chinese property data. Chinese home prices rose for a third consecutive month in July. Even a modest recovery in a sector that accounts for around 15% is a welcome boost for the economy. Home prices across China rose month-on-month in 31 of the 70 major cities monitored. Besides over last few months there has been very little by way of new construction i.e. inventory is being run down. This can only be positive thing when the construction restarts to respond to demand. This down move is overdone. Be careful with EM but Europe and US, good buying opportunity. August 26, 2015 at 2:27 PM × This comment has been removed by a blog administrator.